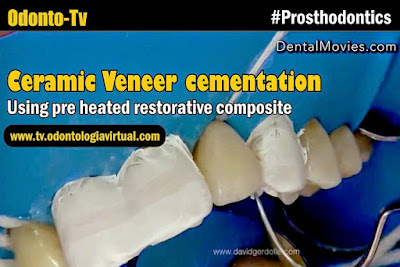 * On the tooth surface: sandblasting (27 microns alumina), etching of enamel margins (H3PO4, 37%), silanisation of the composite base (heat activation), hydrophobic bonding layer (uncured). * On the feldspathic veneer intaglio: etching (Hydrofluorhydric acid), silanisation, uncured layer of hydrophobic bonding. This protocol has been first described by D. Dietschi and P. Magne.